TORONTO -- A night billed as a potential NBA finals preview certainly lived up to its billing Thursday. Kawhi Leonard poured in 37 points, his best as a Raptor, to lead Toronto to its seventh straight victory, a thrilling 131-128 overtime defeat of two-time NBA defending champion Golden State. Kevin Durant scored 51 points -- his third consecutive 40-point performance -- to lead a Golden State squad (15-8) missing Steph Curry. Klay Thompson had 23. The Raptors had lost eight straight to Golden State, but that was pre-Leonard, and now Toronto is the talk of the East. The matchup prompted Thompson to suggest the night was a potential preview of June's NBA finals. The much-anticipated night -- a rare nationally televised game in the U.S., and the Warriors' only regular-season trip to Toronto -- lived up to its promise. The Raptors raced out to an early 18-point lead, and for the most part maintained a double-digit advantage until Durant lit it up late in the third quarter. 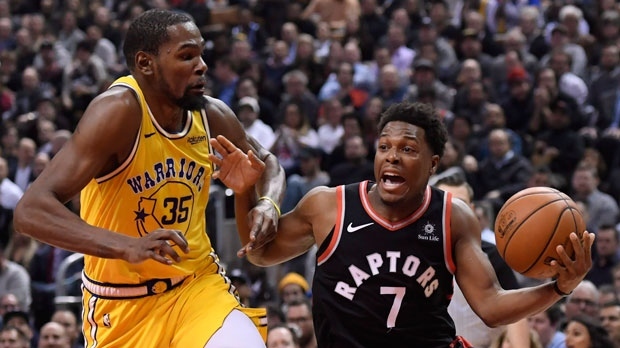 Durant scored the Warriors' final 13 points of the quarter, including a three-pointer from the mid-court Raptors logo at the buzzer that sliced Toronto's lead to 96-88, and set up an edge-of-your-seats final frame. Thompson capped a 9-0 Warriors run that pulled the visitors to within two points with eight minutes to play. But the Raptors clawed their way back and when Green drilled a three-pointer with 4:42 to play, it capped an 8-0 run that put Toronto back up by 10, prompting a deafening roar from the Scotiabank Arena crowd that included Toronto Maple Leafs coach Mike Babcock, Drake, and UFC featherweight champion Max Holloway. Up by just three points heading into a crazy final minute of regulation, Lowry drilled a thrill, but Durant replied with two of his own, his second dagger tying the game with 8.6 seconds to play and sending it to overtime. The night had a post-season buzz, and the fans stood for the extra period, erupting when Green knocked down a three with 2:07 to play to put Toronto up by three. With 22 seconds left, and the Raptors clutching a three-point lead, Andre Iguodala had a clear path to the basket but was whistled for travelling, and Siakam iced the victory with three free throws in the dying seconds. Nick Nurse certainly was dressed for the occasion. The Raptors coach wore a shiny royal blue suit jacket for Sager Strong night in honour late NBA sideline reporter Craig Sager, known for his colourful attire. Leonard went into the game a perfect 6-for-6 in the regular season and playoffs against Golden State since the 2014-15 season, averaging 20.1 points, 6.9 rebounds, 2.4 assists and 2.1 steals per game. Curry, meanwhile, sat out with strained adductor (groin). The two-time NBA MVP hasn't played since the Nov. 8, but is expected to return Saturday in Detroit. The Warriors were also missing Draymond Green (toe injury). The Raptors will get another chance at Golden State soon -- the Warriors host Toronto on Dec. 12. While the Raptors' pre-game mantra for Golden State "just another game," Warriors coach Steve Kerr said it was no ordinary night. "It feels different for us when we know we're playing one of the best teams in the league. The media coverage we're used to, the fans outside the hotel," Kerr said. "(But) we're well aware of who we're playing and who we might see later on and tonight is definitely one of those games." The Raptors seemingly couldn't miss in the first quarter, with Leonard, Siakam and Ibaka shooting a combined 12-for-12 to start, and Toronto shooting 72 per cent in the frame. The Raptors went up by as many as 18 and led 38-25 to end the quarter. The Warriors pulled within eight points with a 21-10 run in the second, and the Raptors went into the halftime break up 67-58. The Warriors game was the second in a tough stretch for the Raptors. Only four of their next 14 games come against teams with losing records, including two against Cleveland.